Rating: Average 4.33 / 5 out of 6 total votes. Summary: Touzuka High School is a public school with a very low grade point average. One day, a girl, who had been expelled from the state's top school, St. Katria Girls' School, transfers in...Her name is Kawaii Maria. The official reason of her expulsion was due to "violence against the teacher." Because of straightforward comments, Maria starts to become isolated from her class...What is hidden in her past and what will happen to her? 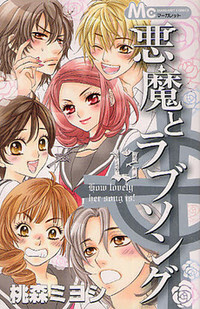 Akuma to Love Song revolves around an unusual girl, Kawai Maria who was expelled from her previous school, St.Katria Girls' School, and soon transfers to Touzuka High School, a public school with low standards. Her sharp tongue and straightforward personality often leads everyone else to hate her with the exception of two handsome boys who eventually get involved with her. With a devil's aura like hers and an arrogant facade to pair it up with, it's just too hard to be understood. And so Maria needs to deal with bullying, adjusting, fitting in and romance. Just how will a devil like her cope with all these predicaments?